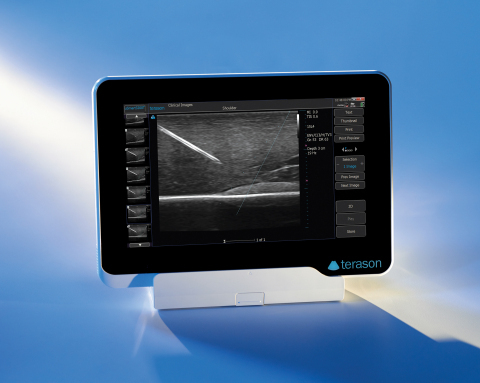 BURLINGTON, Mass.--(BUSINESS WIRE)--Teratech Corporation today announced the launch of the new uSmart 3200T Ultrasound System, the first in Terason’s uSmart family of proprietary products. This revolutionary new tablet, deemed “disruptive technology” by industry leaders, will change the way healthcare is delivered in both hospital and outpatient sectors of point-of-care ultrasound. The new light-weight, power-packed uSmart 3200T Ultrasound System is a fusion of cutting-edge technology with an intuitive interface that defines simplicity. The newest member of the Terason family weighs less than 5 lbs., provides razor-sharp image quality, and is fully equipped with all the features and functionality users have come to expect from Terason products. Developed by clinicians for clinicians, the uSmart 3200T provides the best tools for busy practices, including a 128GB Solid State hard drive, Smart Gestures, an Adaptive Touch Screen, uConnect remote capabilities, and a fast boot-up time. As an industry pioneer, Terason developed and was the first to patent color portable ultrasound. Since then with over 50 patents protecting the technology, our crystal clear image quality, open architecture, and customer dedication has earned us a reputation for excellence. This reputation is what motivates Terason every day to strive to exceed expectations and industry standards, providing our customers with the latest advancements in portable ultrasound. “I am confident that every facility conducting ultrasound exams will benefit from this technology. The uSmart 3200T represents Terason’s continued commitment to expanding its product portfolio in order to meet the diagnostic needs of our worldwide customer base,” added Sirek. Follow us on Facebook and visit us on YouTube! Terason, a division of Teratech Corporation began in 1994, drawing upon technology developed at MIT’s Lincoln Laboratory. Dr. Alice Chiang, CEO and Chairman of the Board, founded the company to apply developments in the fields of radar, sonar, and telecommunications technologies to the demanding requirements of battlefield ultrasound. Recognizing that decades of breakthrough research for the Department of Defense could be applied to the challenges of mainstream ultrasound imaging, she formed the Terason division. With initial key patents protecting the integrated circuit technology she developed at MIT, Dr. Chiang dedicated Terason to the development of a micro-miniaturized commercial ultrasound system. Today, we continue to revolutionize ultrasound with developments in high-performance portable systems. The new proprietary uSmart products provide exceptional imaging capability and the advanced features and functionality users have come to expect from Terason. These complete ultrasound solutions optimize workflow, enhance clinical efficacy, and increase productivity for everyday clinical needs. For more information go to www.terason.com.